The Psalmist encourages his readers to heed God’s call to “be still and know that I am God.” What does it look like to be still? How do we know? We live in a world and culture that encourages a fast pace. In an age of smart phones and social media, there is a constant temptation to stop what we are doing to check. Check our e-mail. Check our Facebook feed. Check that last text message. If you take a moment to look at a day in your life, you may notice that even when you are sitting still, your mind is going a thousand miles per hour. Fast pace or Be still? This pace may be supported by the belief that doing more, faster, equals better. But does doing more increase well-being, or meaning in life, or effectiveness? I have often seen how a fast paced life and fast paced mind corresponds with problems sleeping, increased fatigue, anxiety, depression, or an inability to take part in the wonderful yet mundane things in life. However, often even if a person tried to slow down the mind, they would find that their mind still races on at its own pace with or without permission. So, even if we wanted to, how can we be still? Mindfulness, which has foundations in both Buddhist and early Christian traditions, is one path to slowing down, to being still and knowing. Mindfulness is a practice, a dedication to notice the present moment and pay attention to it without pushing or clinging. If you are breathing, notice your breath as it goes in and as it goes out. If you are eating, notice the taste, the smell, the texture of your food. And if your mind wanders off, don’t judge yourself and say you’ve failed at mindfulness. Simply turn your attention back to the task at hand; notice again what you are doing. Is mindfulness really that easy? Could it really be that simple? Our problems are so complex – could taking time to stop and notice our breathing really make a difference in our lives? While mindfulness won’t solve your problems in life, it may just free up some of the energy that is spent on mental ruminating, worrying about possibilities, or punishing ourselves for past mistakes. I see mindfulness as a fundamental for wellness. Just as practicing basic multiplication facts prepares a child to eventually tackle calculus, so practicing mindfulness prepares a person to manage the complex realities of life. Even more, if you practice stopping and noticing, you may just find that there are some really wonderful things that you are missing. I was driving home in traffic the other day and was obsessing about how much time I was wasting sitting in traffic, thinking about all of the things I could be getting done. Then, as is my practice, I stopped to notice and be mindful. I looked up and saw something beautiful. The mountains of Colorado are in front of me every day. On this particular day the mountains were lit up behind storm clouds. The contrast was stark and stunning. The colors were vibrant and clear. I noticed beauty in that moment and smiled. I realized I was missing a wonderful moment in life because my mind was running mindlessly. 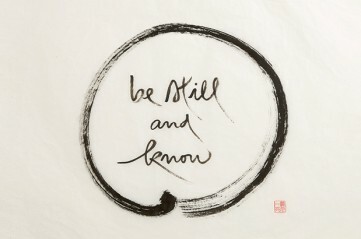 I encourage you to take time to practice – to be still and to know. Notice the beauty around you. Notice the people around you. Notice your breath. Notice the task at hand. You may find that by stopping and being still, by knowing, you feel more at peace, and you free up energy to deal with the tasks in front of you. If you’d like more information and help in practicing mindfulness, or you want support in slowing down an anxious, fast paced life and mind, feel free to contact me at Grace Counseling. I would be glad to join you in your journey. Rob Gibson is a psychologist with Grace Counseling, and brings his peaceful and caring demeanor into each session. When you are ready to schedule your first appointment with him, call (720) 489-8555.